To build or restore muscle and bone tissue requires hard work – intense effort. It doesn’t matter what you believe or what you think will do the trick. Your opinions on the issue do not supersede science. In other words, you’re thrice weekly tennis game isn’t going to preserve or build muscle. Neither will your Yoga class or your morning speed walks with Mabel or your jog around the whatever it is you jog around. So when you hear the industry experts say fluff like “Do what you will enjoy! Do what you will stick with!” ignore them. It’s a good recommendation when trying to figure out a hobby, but not for transforming and strengthening your body. Imagine if that same expert said that about diet? Just eat what you enjoy! Uh huh. You have to strength train and you have to do it properly, meaning, safely and with a high enough degree of effort that your body gets the idea that you want more of what you already have. Then you rest, meaning, take days off from exercise, and this is when you build and strengthen. The little dude at the top of this post is lifting his barbell way too fast. He’d get an earful from me if I was training him. When you lift, count a minimum of 5 real seconds to lift a weight and the same or slower to lower. Lift and lower until you can’t lift the weight against your best effort to do so. Choose a weight or a resistance level that allows for between 60-90 seconds of total effort until your muscles are pooped out. 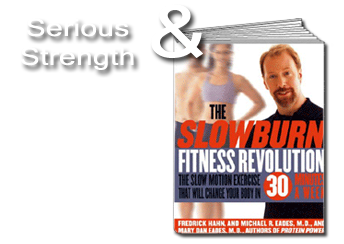 Add a small amount of weight each session – as little as one pound. 5-10 different exercises are plenty.Train your whole body each session. 2 sessions a week. Let me know how it goes. Hi, Fred… I do have a question: My knees have been a problem for me for over a decade (I’m 62 yrs old) — though most of the time I don’t notice any pain, a few weeks ago, I fell on my knee and it’s more sensitive than usual to prolonged standing or walking. I’ve stopped the SB exercises that involve my knees in any way and this was just a couple of weeks after I’d gotten back to the SB after a year of not doing them and losing muscle all the while (at my age it happens fast without regular exercise). My thighs are so lacking muscle that I am afraid to go much longer without exercising them. Are there any exercises at all that will strengthen my leg muscles, particularly my thighs, that don’t require my knees? 1. You say “Then you rest, meaning, take days off from exercise, and this is when you build and strengthen.” What happens if you don’t? 2. What happens if you split up your exercises into daily sessions and each of those sessions concentrate on one part of your body’s muscles and you do not repeat those particular exercises for at least three days? 3. Is it impossible to build up muscles if you exercise daily? ****The you don’t build and strengthen or not nearly as well as you could. ****Not a good idea. Exercise is NOT NOT NOT what causes the benefits. The body creates the benefits in response to proper exercise IF IF IF sufficient rest and recovery is allowed for. ****Possible, yes – for a time that is. But desirable? NO!! Why would you want to exercise everyday? Fred, I have noticed that I do not have DOMs the day after I do a session of SB. Another difference is that my arms and legs shake and I can feel the blood rushing to my muscle when I exercise. Is it normal to not have DOMs? And I have to say that following your DVD made all the difference in good form for me. I consider that to be one of the best investments I have made in years. ***Yes it is. BUT…are you training to complete muscle fatigue within 60-90 seconds? ****WEll!! Thanks so much for saying so. If you ever need help, let me know. Yes. And I have noticed that I can do even LESS of the door knob/chair exercise [where I lower myself into the chair] the more times I do it, because as I can gain more control, the better my form gets and the less I rely on the door knob. That really is a very hard exercise when done right!! I started 4 weeks ago doing the exercises 1x a week and then read more carefully where you instructed 2x a week. I am in my second week of 2x per week. Hi Is twice a week possibly too much for some? Doug McGuff’s view is that the average recovery time is 7 days. Do you recommend one set per bodypart? ****In my experience, two weekly sessions work best for most people I have trained. Even three can work well but a third won’t make much difference in my view. Two session definitley work better for me without question and I train VERY intensely. ****No. One set per exercise and it doesn’t hurt to do a breakdown set now and again if you are trying to maximize muscle mass as a body builder would. My book is for the typical person looking to get stronger and healthier, not for a body builder or a power lifter. Most body parts require multiple exercises. What are you thoughts on reaching the point of concentric failure? More specifically, do you feel that reaching this point sort of sends a message to the body to grow stronger in addition to the overload it encounters? Do you think no longer being able to move the resistance concentrically adds to the stress signal place on the body? Or is reaching concentric within the suggested TUL just a good indicator of sufficient load? Just thought this might add to the conversation. Twice a week is definitely too much for me. I have psoriatic arthritis (which really is tendon inflammation) and exercising twice a week will put me in pain in about two to three weeks. I need at least a week between sessions. Even five days is too much. I have to walk a fine line between staying strong and staying pain free. I have tried McGruff’s recommendation of a two week time period between intense workouts, and it seems to work for me. I still work out once a week to make it a habit. Donnie – reaching failure within the anaerobic range (10-90 seconds or so) means that you are engaging most if not all of the higher threshold motor units. The load is sufficient if failure occurs within that time frame. Damien – try switching to a paleo/ancestral diet. It will help. Previous post: What Did You Feed Your Kids This Morning?